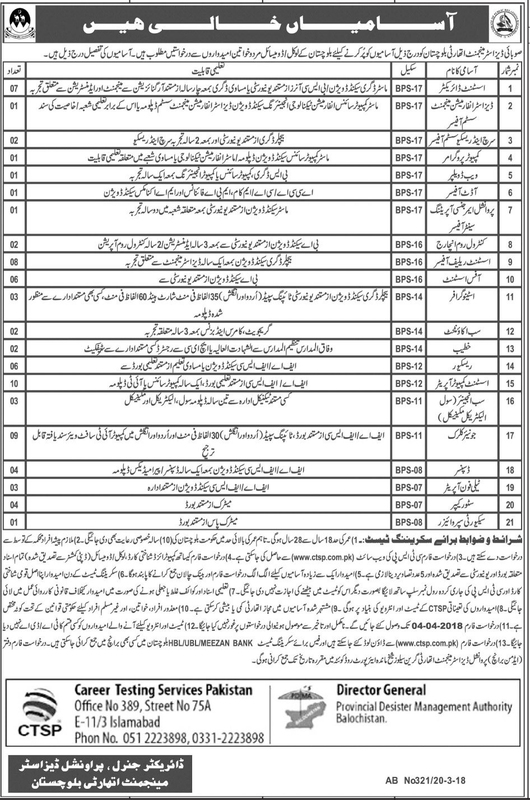 Government of Balochistan has announced New Jobs in Daily Jang Newspaper 21/03/2018 in Provincial Disaster Management Authority. Candidates can apply for Rescue 1122 Jobs in Pakistan as Assistant Director, Disaster Information Management System Officer, Search and Rescue System Officer, Computer Programmer, Web Developer, Audit Officer, Provincial Emergency Operating System Officer, Control Room In-charge, Assistant Relief Officer, Office Assistant, Stenographer, Sub Accountant, Khateeb, Rescuer, Assistant Computer Operator, Sub Engineer Civil Electrical Mechanical, Junior Clerk, Dispenser, Telephone Operator, Storekeeper, Security Supervisor. Applicants are directed to Visit Center Testing Service Pakistan Website to download Application form. Provincial Disaster Management Authority 77 Jobs Daily Jang Newspaper 21 March 2018.